A Daryl’s Rock and Wire Works tandem cake topper mounted on a base. Daryl started making sculptures when he was twelve-years-old. Some of his first sculptures were a helicopter and airplane. As he got older, Daryl decided to combine his sculpture-building talent with his love of biking and rocks. Today, Daryl continues to create one-of-a-kind pieces of artwork using bronze, welding wire, and rocks. He hopes that you enjoy his artwork as much as he enjoys creating it. Daryl has been working on some great new rock art projects. One of the most exciting of the projects is the etched rock with lights that can be made into a beautiful display. 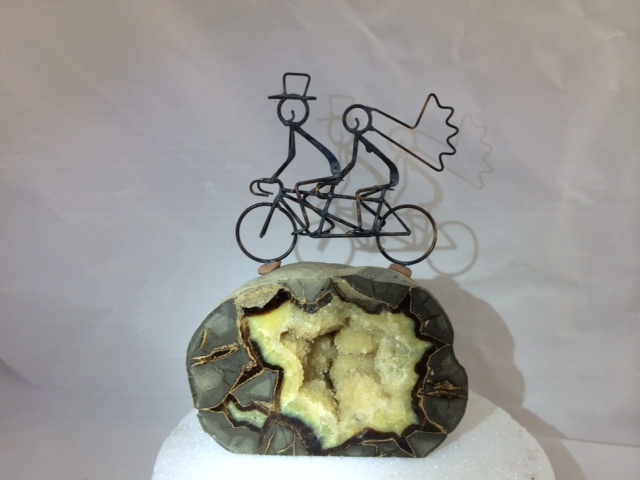 One of the fun etched rock pieces that he has been working on is perfect for a bike lover’s wedding, either for a gift or display. 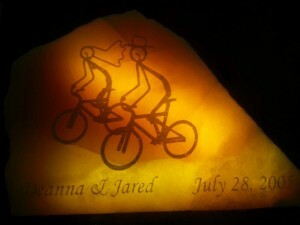 An image of his bike cake toppers is taken and etched into a rock along with the couple’s names and wedding date. An LED light is added which adds a pretty glow to the piece. These displays will soon be available in the store and we are taking custom requests through the Contact Us page. Later this month we will be adding the airplane cake topper to our store. 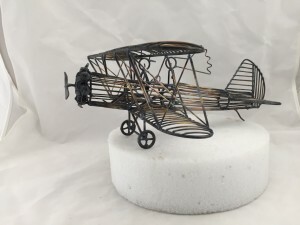 Be sure to check back for more updates and contact us to reserve your airplane cake topper. 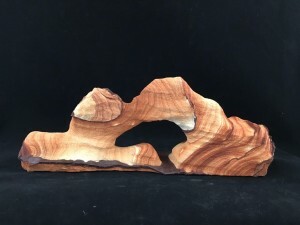 Our newest rock bases will be coming to the store at the end of March. We have some beautiful choices that we're excited to share with you. If you're looking for a base right now, contact us. Even though our new bases aren't in the store they are still available for purchase through our customer service. Our bases are a great way to display your cake topper or to create a sculpture for a gift. Take a look at one of the great bases we have. If you're interested in a base like this one, act quickly because the arches don't last long.